At the Great Vigil of Easter tonight, we will renew our Baptismal Vows (BCP 292) in much the same fashion as early catechumens “handed back the creed” before their baptism in a series of questions and answers with the bishop, who had taught them in a series of sermons in the weeks leading up to Easter. 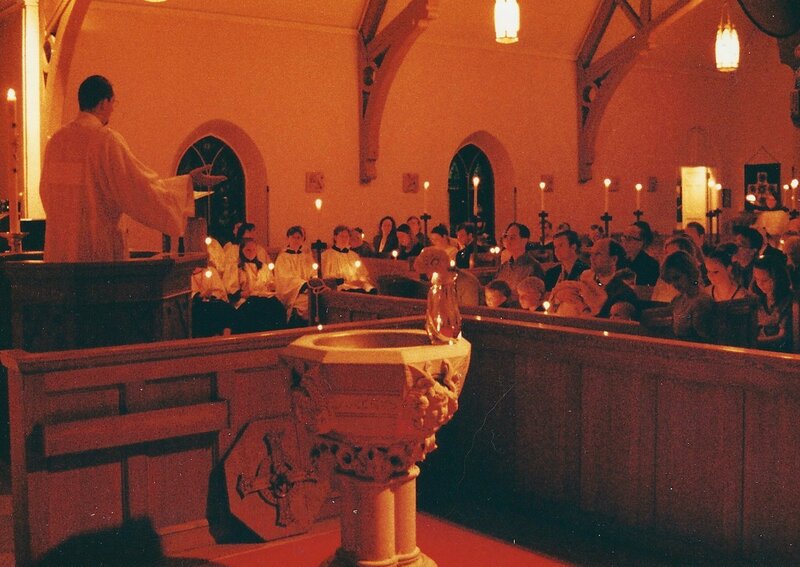 After the vigil readings and their questioning, the catechumens were led to the baptismal pool and immersed three times “in the Name of the Father, and of the Son, and of the Holy Spirit.” They were then anointed with oil, clothed in a garment of white linen, and brought back into the church to receive communion for the first time. According to Robert Louis Wilken, “At their first Eucharist they received a cup of milk and honey, and during Easter Week they attended services in their white garments” (Spirit of Early Christian Thought 39). That same spirit of joy permeates both the Eucharist and the Daily Office not just tonight and tomorrow, but throughout the Great 50 Days of Easter. Not only do we adorn the Eucharist with white vestments and altar hangings, we also sing Alleluias throughout the service. Not only do we begin and end the Office with Alleluias, we also say the Invitatory canticle “Christ our Passover” (BCP 83) every morning, and we “hand back the creed” — the Apostles’ Creed — as a daily reminder of our dying and rising with Christ and our baptismal unity with the apostles. and we are reconciled to God. This entry was posted in Book of Common Prayer, Daily Office and tagged Apostles' Creed, Baptismal Covenant, Evening Prayer, Exsultet, Great Vigil of Easter on March 30, 2013 by Rodger Patience.